A manicure will stimulate nail growth and soften dry, dull skin. 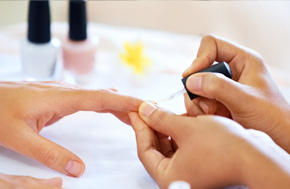 Our Deluxe Manicure includes nail trim, shaping, cuticle care, exfoliation, deep moisturizing, hot towels, massage, and polish of your choice $20. Our Deluxe Spa Pedicure is a multi-step pampering process which includes nail trim, shaping, cuticle care, pumice scrub, exfoliation, callus treatment, hot towels, massage, and polish of your choice $35. Gel manicures create lasting color and shine while strengthening your natural nails. It is non acidic and odder-less. The gel bonds to the natural nails without excessive buffing, therefore no damage to the natural nail. The greatest thing of all is ZERO DRY TIME $30.